On Friday, 4th of January, a few days before turning 40, Dr. Sandra Annunziata passed away suddenly. A regular contributor to the AESOP’s initiatives, she was a tireless and committed researcher, bringing the whole of her originality and curiosity into her studies. Sandra was incomparable: a force of nature, a well of never-ending generosity and openness, on top of an outstanding academic, an expert of her field, a dedicated researcher that never ceased to question injustices, a kind colleague that always had time for anyone and everyone, regardless of the status they held and the field they worked in. Sandra graduated in Architecture at the IUAV of Venice in 2004. In 2008, she defended her Ph.D. thesis at the University of Roma Tre. “Un quartiere chiamato desiderio: la transizione dei quartieri popolari in Brooklyn e Roma”. Prepared under the supervision of Marco Cremaschi, the dissertation dealt with the processes of gentrification and neighbourhood change in contemporary cities in Rome and Brooklyn (NY), investigating the process of change occurring in two neighbourhoods in Rome and New York. The complete empirical fieldwork comparison, can be found in Later, she investigated the forms of urbanity in a few newly built urban developments in Rome. After her PhD, she carried out studies and fieldwork at Columbia, New York (2007), Cornell, Ithaca (2011), as well as at Weimar (2008-9), the Institute de Research Social of the University of Genève (2012) and Leicester University. Between 2008 and 2009 she directed with Marco Cremaschi the Strategic plan of the city of Arezzo, coordinating the research team of the Department of Urban Studies. The Plan was the first awarded by the Region Toscana. The team included a number of young researchers and doctoral students from the same Department that became eventually a close-knit group of friends and the core of Eticity. Sandra established this association with Mara Cossu, Claudia Faraone, Carlotta Fioretti, Claudia Meschiari, Viola Mordenti and Alice Sotgia with the motto “Exploring Territories, Imagining the City”. A successful crew of reflexive planners and engaged young women that often met around a dinner looking in turn after the children of Mara, the first to experience motherhood. In 2009 she was awarded the Giovanni Ferraro Award for her PhD dissertation; and in 2011 the prestigious Clarence Stein grant for independent research as Visiting Scholar at the Department of City and Regional Planning of Cornell University, USA. The scholarship allowed her to carry on an interesting study on tenurial change in historical garden cities comparing Garbatella in Rome and Sunnyside in New York (Annunziata, 2017). Once back in Rome, Sandra continued her collaboration with Cornell University, being involved from 2012 to 2018 as visiting critic for the course European Cities, held in Cornell in Rome. Sandra was an enthusiastic teacher, who transmitted to students most important challenges European cities are facing (housing, migration, gentrification) through direct experience: often lecturing not in class but in the lively spaces of the city, involving local communities as well as international scholars. Between 2013 and 2015 Sandra has been involved in a research project of national interest (PRIN) on the inclusion of migrants in small municipalities. The project was aimed at shading light on a phenomenon not enough studied yet but increasingly relevant especially in Italy where nearly half of the foreign-born people lives in small sized urban centres. Sandra conducted a thorough fieldwork in Roccagorga, a town of 4500 inhabitants located in the mountains of Lazio region, in central Italy. In particular, her research was able to highlight strengths and criticalities of the Italian reception project for refugees known as SPRAR (Asylum Seekers and Refugees Protection System), showing the potentiality for combining the inclusion of migrants with the local development of inner areas. The results of the research have been published in several articles (Annunziata, 2015; 2016; 2017) which are even more valuable today, that the existence of SPRAR has been questioned in the national debate. Thanks to a Marie Curie, she engaged in her postdoc work with Prof Loretta Lees in Leicester where she met Clara Rivas. Together, they wrote articles wondering about resistance to gentrification, trying to push forward other understandings of resistance that were more inclusive, questioned themselves, and whatever hierarchical systems they might be inadvertently reproducing. Sandra’s knowledge of gentrification theory framed the initial articles on resistance to gentrification: from a literature review to actual resistance practices, Clara and Sandra sought to understand better how gentrification could be fought and possibly defeated. The path carved as writing partners was promising: every new article found a new focus that would be more interesting than the previous one. Recently, Sandra and Clara worked on how everyday practices and visible acts of protests were tied together when conceptualized as resistance to gentrification. She had a way of coming up with fantastic ideas, calling at any time of day or night and letting you in some exciting breakthrough thought. Such enthusiasm was contagious, as it coloured the conversations, texts, presentations and random encounters she participated in. Working within the framework of her Marie Curie project allowed her to bridge that gap between academics and activists, and helped her put her ideas in action: fostering spaces of exchange and activism in the face of acute dispossession. Her knowledge and work was always a source of inspiration. Beyond our academic musings, or probably because of them, we shared plenty of discussions, arguments, drinks, dinners, projects, conferences, laughter, worries. Clara and Sandra had a baby almost at the same time, and in her true unique fashion, Sandra managed to grow into a beautiful mother whilst developing her academic career almost without pause. She did a million things at the same time, relentlessly, and she managed to shine through most of them. That light she irradiated will live on in her work, projects, as a little voice inside our heads whenever I’ll be looking for the right words, in all her friends and colleagues and people she tried to help, and of course in Elena, her daughter. (2010). with Cossu, M., Urbanity beyond nostalgia: discovering public life at the edge of the city of Rome. In Suburbanization in Global Society (pp. 131-152). Emerald Group. (2011). Evolving urban citizenship and the erosion of public space in Ponte di Nona, Rome. Cremaschi and Eckardt, Changing Places, pp. 63-81. (2011). with Violante, A.,, Rome-Model: rising and fall of an hybrid neo-liberal paradigm in Southern Europe. In Annual RC21 Conference, Amsterdam (pp. 7-9). (2011). The desire of ethnically diverse neighbourhood in Rome. The case of Pigneto: an example of integrated planning approach. Future Urban Research Series, (4), 601-614. (2013). Eticity ed., “Rappresentazioni urbane/Urban Representations Quaderni di Urbanistica Tre, 3, I, sett.-dic. (2013). with Manzo, L. K. Desire for diversity and difference in gentrified Brooklyn. Dialogue between a planner and a sociologist. Cambio. Rivista sulle trasformazioni sociali, 3(6), 71-88. (2013). with Banfi, E., Snowboarding on Swiss Islam: petit guide illustré pour découvrir l’islam en Suisse. Ed. Alphil-Pr. univ. suisses. (2015). with Fioretti C., Casa e immigrazione nei piccoli comuni, tra inclusione abitativa e sviluppo locale. Proceedings of the National Conference of the Italian Society of urbanism. Venice, 11th-13th June. Planum Publisher. 841-848. (2016). Aria di montagna, percorsi di integrazione nei Lepini. In Fioretti, C. “Inclusione fragile. Migrazioni nei piccoli comuni del Lazio/ Fragile inclusion. Migrations in small municipalities of Lazio”, i QUADERNI – URBANISTICA tre 11(4). (2016). with Lees, L., Resisting ‘austerity gentrification’ and displacement in Southern Europe. Sociological Research Online, 21(3), 1-8. (2017). Exploring the incidence of ownership: evolving forms of tenure in iconic garden communities. The case of Sunnyside, New York and Garbatella, Rome. Planning Perspectives, 32 (1): 1-22. (2018). with Rivas-Alonso, C., Resisting gentrification. Handbook of Gentrification Studies, 393. (2018). with Lees and Rivas-Alonso, C. Resisting Planetary Gentrification: the value of survivability in the fight to stay put. Annals of the American Association of Geographers, 108(2), 346-355. (2019). “Pratiche e discorsi anti-sfratto a Roma in clima di austerità” in Roma in Transizione. Governo, strategie, metabolismi e quadri di vita di una metropoli, Coppola A. e Punziano G. eds., Planim Publisher, Milano. ISBN 978-88-99237-13-4. (Under revision). Urban displacement in Southern European cities during a time of permanent austerity. Evidence from Italy, Spain and Greece, ACME: International Journal for Critical Geographies, special issue Narrating displacement: Lived experiences of urban social and spatial exclusion. (Under revision). with Rivas-Alonso C. “Anti-gentrification practices and the every day life” in Resistances: Between Theories and the Field serie speciale Resistance Studies: Critical Engagements with Power and Social Change, Sarah Murru e Abel Polese eds., Rownam & Littlefield International, London. (Under revision). with Rivas-Alonso C. e Lees L. “Segregation, Gentrification and Social Mix”, in Companion to Wiley-Blackwell Encyclopedia of Urban and Regional Studies, Anthony Orum, Javier Ruiz-Tagle, Serena Vicari eds., Wiley-Blackwell, London. (in press). with Rivas-Alonso C. e Lees L. “Resisting Planetary Gentrification: The value of Survivability in the Fight to Stay Put” in Justice and the City, edited by Heynen N., Aiello D. Keegan C. & Luke N., Routledge, ISBN: 978-1-138-32274-5. (in press). “Probing the right to buy: changing forms of tenure in Garbatella, Rome” in Iconic Planned Communities: Challenge of Change, Freestone R., Corbin Sies M. and Gournay I. eds., Pennsylvania UP, Philadelphia. Editor’s note: The blog of the AESOP Young Academics network is a great place to share and showcase your research about a wide range of topics related to spatial planning. Here is a timely case in point, published on the final day of the YA conference 2019 in Darmstadt. Authors: Fabian Wenner (Munich University of Technology), Freke Caset (Ghent University), Bart de Wit (Ghent University). Academic conferences convey many benefits. They facilitate knowledge exchange, foster personal networks and expose participants to different and inspiring spatial and socio-institutional environments. They may furthermore offer escape from daily routines and provide the chance of experiencing new, perhaps exotic, places. Unsurprisingly, over the last decade academic conferences have grown strongly in number and size. This is a trend that has been supported by the expansion of universities and the differentiation of disciplines, but also by the relative reduction of the costs and effort to participate. Some conference series have developed into global events attracting scholars from all over the planet. These general trends also affect the academic disciplines concerned with spatial planning and research. Take the case of the Association of European Schools of Planning which was founded in 1987 and has meanwhile diversified into a number of sub-associations, each with their own conferences, such as AESOP Young Academics, the AESOP Transport Laboratory of Thought or the International Academic Association of Planning, Law, and Property Rights, alongside the almost 1000 attendees strong annual meeting. The proliferation of international academic conferences nonetheless poses some considerable questions concerning its sustainability. From an economic sustainability point of view, conferences should aim to bring together a large and diverse group of attendants at low financial and non-financial costs. From an environmental point of view however, the climate impact of international conference mobility is increasingly recognized as problematic and has recently received much scholarly attention. From a social sustainability perspective, international conference organisers should ideally pay attention to the spatial distribution of conferences, since they allow local participants to tap into global knowledge networks. At the same time, they may generate other positive externalities such as local added value in the hospitality industry. Organising a conference thus comes with a range of (more or less explicit) decisions, which result in differentiated ecological, economic and social sustainability outcomes. Our recently published paper in disP – The Planning Review “Conference Locations and Sustainability Aspirations: Towards an Integrative Framework?”focuses on two of these decisions in particular: the deliberation regarding conference location(s) on the one hand and conference format on the other hand. As for conference locations, there may be a deliberate focus on geographical proximity between the conference venue and the pool of participants. Alternatively, a more secluded location or additional touristic benefits in less accessible or more ‘peripherally’ located areas may be explicitly desired. Another, arguably prevailing, logic is ad-hoc, based on candidacy and thus involving a fair dose of coincidence. As for the conference format, a variety of possibilities also exist. For example, while the majority of academic conferences are single-venue meetings, there have been recent experiments with multi-venue conferences, where a conference is hosted simultaneously across several venues which are interconnected by video-telecommunication. Conferences may also change locations from year to year, typically rotating among member institutes, or they can be organised at the same location each time. Each particular combination of conference location and conference format alternatives will lead to different sustainability outcomes in terms of ecology, the economy and society. We contend that these considerations and their implications seem particularly relevant to the disciplines of spatial planning and research, as balanced sustainability is a widely acknowledged disciplinary goal. Nonetheless, there seems to be only little debate on this topic among scholars working in the field. Against this backdrop, the paper develops a conceptual framework for conference location and format decisions. Afterwards, the framework is applied to the 2017 edition of one of the largest annual academic conferences within the domains of spatial planning and research: the AESOP conference. Following these theoretical and empirical explorations, we conclude that one of the combinations of format and location decisions distinguished in our conceptual framework may be of particular interest in order to meet meaningful sustainability aspirations. A rotating multi-venue format with centralised secondary venues seems most promising in delivering the most sustainable outcomes. Depending on the geographical reach of the conference, a replacement of one global with multiple continental venues or one continental with multiple national/regional venues, supported by teleconferencing, could drastically reduce the environmental impacts of conference-related travel. In terms of social sustainability benefits, such actively-pursued, programmed spatial rotation of venues among members could furthermore ensure a fairer distribution in outcome rather than a “neutral” location application process, disseminating more widely the local planning issues and challenges of the host locations. From an economic perspective, we nonetheless hypothesise reduced advantages in terms of the agglomeration economies, exchange of knowledge and the potential for serendipitous contact. The exact outplay of these economic effects will nonetheless depend on the number of secondary venues and other parameters involved. Positive economic benefits may however arise due to increased efficiency gains (reduced travel times and, most likely, travel cost). Hence, a crucial avenue for further research is to increase our understanding of the extent to which the social practice of interaction with fellow academics at conferences, and the scientific progress that may arise from it, could be jeopardised by this new type of academic conference. Future research and practical experiments should therefore aim to elicit preferences, values and expectations of academics in order to identify the conditions that are necessary to render multi-venue conferences an attractive and broadly-supported option. We conclude with the contention that in particular spatial planning and research organisations dealing with sustainability issues should translate these concerns more explicitly through their decisions on conference format and location. More than in other disciplines, location is crucial, as the “laboratories” of planning are the very cities and regions. While currently these considerations may be of a pragmatic nature, we assert that conference committees should aim for emission-minimising and spatially-balanced conference locations in the longer term by pursuing a more active strategy. Fabian Wenner is Research and Teaching Associate at the Chair of Urban Development at Munich University of Technology; Freke Caset is PhD researcher in Geography at Ghent University; and Bart De Wit is a geomatics expert at the Deparment of Geography at Ghent University. Editor’s Notes: 1) This article is republished from The Conversation under a Creative Commons license. Read the original article. 2) In the run-up to the AESOP Congress this summer, many of us will likely explore AirBnB solutions. This timely post shows Venice already faced some aspects of current dilemmas regarding shared urban economies. The “AirBnb problem”: a balancing act? A balancing act. 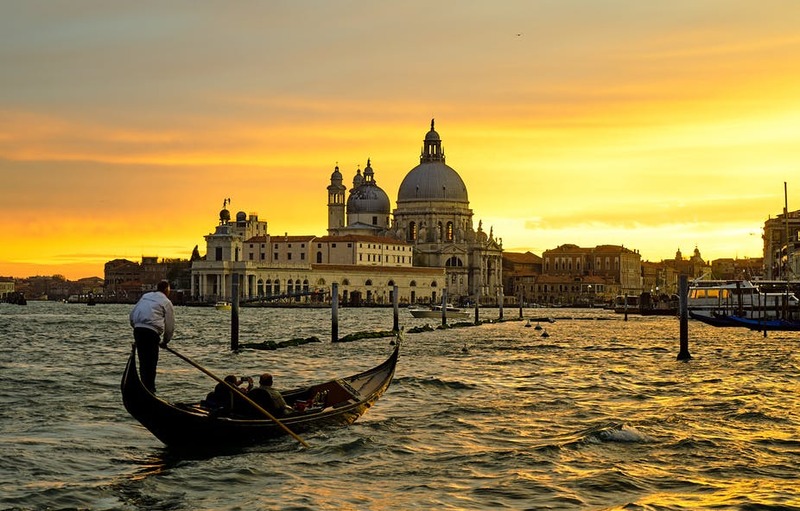 Picture credit: “Venice, Italy” by Pedro Szekely on Flickr, CC BY-SA. Buzzing. 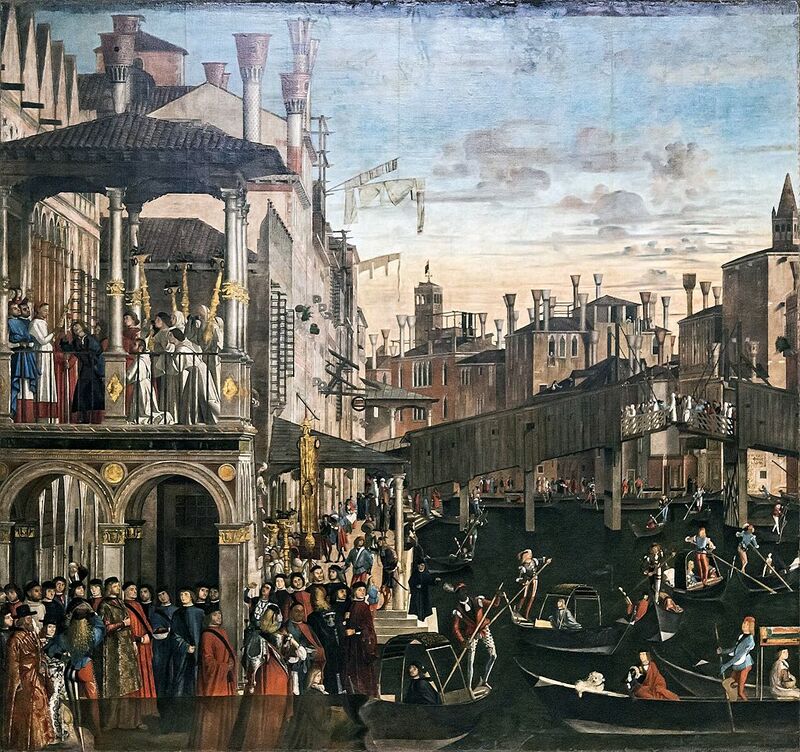 Image credit: Vittore Carpaccio’s painting showing a miracle healing in Venice, circa 1496. Wikimedia Commons. Rosa Salzberg is Associate Professor of Italian Renaissance History at the University of Warwick. This post is a free translation of an article originally published in the French edition of The Conversation on 21 January 2019. « Eco-logy » : the science of “home”, “habitat”, or even the natural “environment”. Coined in the late nineteenth century by the biologist Ernst Haeckel, the term has since generated an impressive terminological diversity : plant ecology, urban ecology, conservation ecology, conservation, agroecology, reflecting reflects an increasingly precise understanding of ecological diversity on earth over time. However, it is interesting to note that the term has long been anchored in the following paradigm : the understanding living beings by through the construction of two separate realms, the one being human, and the other being nature. Several authors have since challenged this dualistic approach to ecology. We propose to shed new light on these criticisms and explore a new approach to ecology : the discovery and the potentialities offered by the study of the links between the human and the non-human, which we call “relational ecology”. In his book Philosophy and the Mirror of Nature, Richard Rorty was interested since the 1970s in the use of the term “nature” in the Enlightenment. He shows that the term “nature” quickly replaced the term of “God”, becoming a new “absolute” from which philosophers imagine the world without ever questioning the limits of these notions. This philosophical orientation has tended to impose itself globally, with major consequences in the ways of thinking and inhabiting the world. However, a look on the diversity of cultures and territories tells us that this approach is far from universal. For anthropologist Philippe Descola, the radical separation between culture and nature that results from it, is even one of the specific characteristics of “modern” societies : a position that the author calls “naturalism”. This paradigm considers the interiority of human beings as discrete and thus relatively autonomous from environmental constraints. While this view of the world is widespread in Western societies, it remains but one particular view within the diversity of human-nature relations that characterise individual societies. By way of example, the Cartesian dualism between those who “think”, humans, and the non-thinkers, the non-humans, has brought to light a division of the world between subjects and objects within political philosophy, which does not provide a sufficient political and legal response to the current climate crisis. This approach confines the non-human to the status of resource to be exploited and reduces the possibilities of its protection, while inhibiting many legal jurisdictions to recognize the responsibility of humans in environmental crises. It is therefore urgent to find a way out of this dualism to tackle the challenges of our world differently. Relational ecology can constitute a new method of thinking about our relationships with others living beings and territories. We will describe it in its three founding moments: reconsidering diversity, acknowleding vulnerability and imagining new spaces of connection. In The Order of Things, Michel Foucault explains the extent to which the practice of « making things similar » (i.e. categorising, or naming) in modern societies is the foundation for the construction of knowledge. While this logic has been able to produce exceptional scientific results, it does not enable us to consider diversity. Indeed, according to this logic, new knowledge can only be apprehended from an “a priori” of a previous knowledge. Thus this “a priori” carries a risk of neglecting the particularity of the object that is considered. Ecological sciences have fallen prey to this logic as well. For a long time, animal and plant species have been considered only because of their fundamental distinction with humans. Yet new reseach shows that any species can be seen to display societal behaviour in its own way. The studies conducted by Sabrina Krief’s teams at the French National Museum of Natural History on chimpanzees are an important case in point. And just as great apes have their own cultural codes, crows do mourn their loved ones, beavers are able to alter streams and plants collaborate with another one. Humans are not the only ones who can built complex social worlds. A tool that takes into account this diversity is what Raimon Pannikar calls the “dialogical dialogue”: to extend the practice of dialogue beyond reason to include sensibility, sensations and emotions, which taken together enable one understand both the specificity and plurality of other beings. In her book Elements for an Ethics of Vulnerability, French philosopher Corine Pelluchon defends the idea that every living being (humans included) remains permanently vulnerable to others. This vulnerability is first materialized by all the cycles of life and, by extension, the finite nature of bodies. Vulnerability is also evidenced in all the daily acts that connect us to others, such as acts of feeding, clothing, healing, working, or transporting us. To fully acknowledge vulnerability is to accept a relationship based on the interdependence between humans and their environment. Research in geography and anthropology shows that societies have always been subjected to the constraints of the natural environment, forcing them to adapt and modify their practices and cultures. Conversely, human actions have deeply shaped landscapes and territories. Societal trajectories are therefore the consequence of complex, historically rooted relations between a society and its natural environment. Finally, to do justice to diversity and reconsider human-nature relationships in a more holistic perspective is also means to rethink spaces of connection between humans and non-humans. Three connective spaces seem particularly interesting. The first relates to encountering. In her latest book The Mushroom of the End of the World, anthropologist Anna Tsing gives the example of the matsutake mushrooms growing in the deep forests of Oregon, to emphasize that the encounter between human and a non-human leads to something much greater than the sum of the parts. The relationship that is established brings out intelligence, friendship, memories, and dialogue. In short, a world of interactions that is specific to the individuals that engage in it. The second space of connection is anchored in the spatial planning process. In recognising the singularity of every single region, city and rurality and integrating what anthropologist Tim Ingold calls “a radical ecological sensibility” or a realignment of our personal subjectivity and emotions with territorial actions, we enable new ways of inhabiting territories to emerge and are then able to value a diversity of shared modes of existence between humans and the non-humans. The manufacture of legal rights is the third relational space. Some authors see in these spaces, which they call spaces of “coviability“, the possibility of creating new norms extend beyond strictly human categorizations. The end result would be a legal system that is enriched by the diversity of both humans and non-humans, and would therefore be less anthropocentric and better adapted to the ecological realities of the world. By focusing on the relationships that interconnect us, “relational ecology” is a proposal to reintroduce, in both thought and action, spaces of understanding and sharing between humans and non-humans. By doing so, it enables us to refresh our knowledge about the links between societies and their environment, and proposes to focus on territorial diversity in order to provide relevant responses to social and ecological crises. Damien Deville is PhD in geo-anthropology of nature at Paul Valéry University in Montpellier, France, and co-founder of the AYYA movement which works to integrate relational ecology methodologies in spatial planning. Pierre Spielewoy is PhD and lecturer in international environmental law at Rouen University, and CBD (Convention on Bioligical Diversity) project leader at the French Natural History Museum in Paris. Also co-founder of the AYYA movement. You probably know which conference you will be attending next (like the next AESOP Young Academics Conference “Planning Inclusive Spaces” or the AESOP Congress “Planning for Transition” for example). You may also be attending the upcoming ACSP annual congress. Below is a selective list of international conferences. The entries are listed by abstract submission deadine. Feel free to share relevant conferences to: blog@aesop-youngacademics.net, or on the AESOP Facebook group. Workshop on Social Innovation in Southern European cities. Gran Sasso Science Institute (l’Aquila, Italy), 4-5 June 2019. Abstracts by 11 February 2019. RGS-IBG Annual Conference 2019 “Geographies of trouble / geographies of hope” (Royal Geographical Society-Institute of British Geographers) 28-30 August 2019, London. Abtracts by 15 February 2019.
International Conference on Spatial Planning and Sustainable Development, 30 August – 1 September 2019, Chiba, Japan. Abstracts by 15 February 2019. SPACE International Conferences: 1) Architectural History and Theory & 2) Sustainable Architecture, Planning and Urban Design, both on 3-5 May 2019, London. Abstracts by 17 February 2019. European Place Making Week 2019, 12-15 June 2019, Valencia, Spain. Abstracts by 25 February 2019. RSA Annual Conference 2019: Pushing regions beyond their borders, 5-7 June, Santiago de Compostela, Spain. Abstracts by 28 February 2019. INUAS (International Network of Universities of Applied Sciences) Conference “Housing under Pressure. Dynamics between centers and peripheries” 4-6 November 2019, Vienna. https://www.fh-campuswien.ac.at/index.php?id=2147475 *click for English version. Abstracts by 28 February 2019. Production of Climate Responsive Urban Built Environments International Conference, 22-24 May 2019, Istanbul, Turkey. Abstracts by 1 March 2019. The Asian Conference on Urban Planning and Sustainable Cities UP-CITY 2019, 23-24 March 2019, Hiroshima, Japan. Abstracts by 1 March 2019. CPUD 2019 4th International City Planning and Urban Design Conference, 14 June 2019, Istanbul. Abstracts by 8 March 2019.
International Conference on Sustainability in Energy and Buildings, SEB-19, 4-5 July 2019, Budapest. Abstracts by 8 March 2018. The 55th ISOCARP (International Society of City and Regional Planners) Congress “Beyond the Metropolis”, Jakarta, Indonesia 9-13 Sept 2019 – Abstracts by 17 March 2019. SPACE (Studies of Planning and Architecture Consulting and Education) International Conference 2019 on City Planning and Urban Design, 5-7 July 2019, London. Abstracts by 20 March 2019. ACSP (Association of Collegiate Schools of Planning) 2019, 24-27 October 2019, Greenville, South Carolina. Abstracts by 26 March 2019. Global Transformation and Differentiations: International Migration, Urbanization, and Belonging, Antalya, Turkey, April 25-27, 2019. Abstracts by 31 March 2019. Cities After Transition Conference 2019: 8th International Urban Geographies of Post-Communist States Conference, 25-29 September 2019, Belgrade. Abstracts by 15 April 2019. UDCP 2019 (International conference on urban design and cities planning) 5th NZAAR on Natural and Built Environment, Cities, Sustainability and Advanced Engineering, 10 September 2019, Kuala Lumpur, Malaysia. Abstracts by 15 April 2019. The 7th European Conference on Sustainability, Energy & the Environment – Brighton, UK, July 9–10, 2019. Abstracts by 23 April 2019. RSA 2019 Conference (Regional Studies Association – Central and Eastern European Conference), 11-13 September 2019, Lublin, Poland. Abstracts by 21 May 2019. RSA – All conferences announced here, topical conferences across the whole globe. NAISA (Native American and Indigenous Studies Association) Annual Conference, May 7-9 2020, Toronto. Abstracts by Nov. 1, 2019. Stay put for further details. These conferences are noteworthy, but their submission deadlines are past. Some are relevant professional conferences with set programmes. TICTeC 2019 -The Impacts of Civic Technology Conference from mySociety, 19-20 March 2019, Paris. Registration open. The place to be for digital democracy and civic tech for government. Rencontres Nationales de la Participation 2019, 11-13 March 2019, Grenoble, France. The best, one-stop professional and research gathering about public participation in place-making and spatial planning in France. American Planning Association’s National Planning Conference, 13-16 April 2019, San Francisco 2019. American Association of Geographers Annual Meeting 2019, 3-7 April 2019, Washington DC. Poster abstracts by 31 January 2019, other submissions closed. GISRUK 2019, 23-26 April 2019, Newcastle, UK. Abstract submissions closed. A major GIS-related conference. Mid-Term postgraduate RGS-IBGConference (Royal Geographical Society-Institute of British Geographers), 24-26 April 2019, Manchester – Abstracts by 4 February 2019. IAIA (International Association for Impact Assessment) 2019 Conference, 29 April – 2 May 2019. Abstract submissions closed. ICLALD 2019: International Conference on Landscape Architecture and Landscape Design, 16-17 May 2019, Sydney, Australia. ISPM 2019 (International Society of Participatory Mapping) Conference, 17-19 June 2019, Espoo, Finland. Abstract submission closed. 4th International Conference on “CHANGING CITIES: Spatial, Design, Landscape & Socio-economic Dimensions”, Chania, Crete Island, Greece, 24-29 June 2019. Abstract submission closed. EURA Conference (European Urban Research Association) 2019, 20-22 June 2019, Dublin. Abstract submission closed. Creative Construction Conference 2019, 29 June – 2 July 2019, Budapest. Abstract submission closed. ARCOM (Association of Researchers in Construction Management) 2019 “Productivity, Performance and Quality Conundrum” 2-4 September, Leeds Beckett University, Leeds, UK. Abstract submission closed. 36th CIB (International Council for Research and Innovation in Building and Construction) ICT 2019 Conference, “ICT in Design, Construction and Management in Architecture, Engineering, Construction and Operations”, 18-20 September 2019, Newcastle, UK. Abstract submission closed. Rencontres Nationales du Budget Participatif, Paris, November 2019 Stay put for the gathering of participatory budgeting professionals in France, which will likely have a stronger international focus. Acknowledgements: thanks to Sepideh Hajisoltani, Dato Gogishvili, Orsolya Bokor, Amalka Ranathungage, Jimmy Camacho, Besmira Dyca and Paul Greenhalgh for suggestions of relevant conferences. Note: This post was initially published on the blog of the The Food Climate Research Network (FCRN) on 27 November 2018. In achieving the transition to more healthy and sustainable diets, a major challenge is how to do so in an inclusive and equitable way. In a Western context, this issue is particularly relevant as cities increasingly become more diverse in their ethnic make-up; it is essential to include the entire population across class and ethnicity in this dietary transition. This means moving beyond the current involvement of the ‘green elite’ – mostly white, well-educated and high-income citizens with specific understandings and practices of sustainable food consumption. Today, over half the world’s population lives in urban areas and cities’ food sourcing and consumption patterns have become the main influence on the sustainability of the food system. The challenge of providing healthy and sustainable diets to a growing population is increasingly one for cities to address. Providing inclusive access to healthy and sustainable food requires consideration of the diverse ethnic groups who make up modern cities, and who co-create the food environment with their own cultural food practices and with distinct culturally appropriate food patterns. What could inclusiveness look like in providing sustainable diets to such a multicultural population? This question drives my current research, in which I study Syrian migrants in the Netherlands. My contention here is that identifying pathways to inclusive healthy and sustainable food systems involves looking beyond ‘classic’ sustainable food practices and interpretations (such as participation in alternative food networks like farmers markets or vegetable box schemes) and towards highlighting environmentally friendly practices among migrants that, while existing, are often performed ‘in disguise’ (Dubuisson‐Quellier & Gojard, 2016). It is necessary that we develop a more inclusive definition of what constitutes sustainable food practices in order to engage, recognise and include a broader range of people and their practices in the process of transitioning to a more sustainable food system. This move is essential to avoid exclusion of certain marginalised groups by either not crediting their sustainable practices or by failing to engage them by not speaking their language. Much has been written about inequalities in food access from the perspective of ‘food justice’, a concept which is concerned with equity and power in relation to food security. The food justice approach focuses on how people of certain races and classes are structurally and historically disadvantaged in the food system. This approach largely focuses on the exclusion of poor ethnic minorities from access to alternative food networks such as local farmers markets. Such groups may be excluded because of economic inaccessibility or because the types of products on offer do not cater to their cultural food practices (Allen, 2010; Caraher & Dowler, 2014). In this context, inclusive access refers to a situation where everyone has the ability, expertise or skills to participate in the alternative agrifood movement. Others highlight different elements of inclusion, such as having access to an allotment garden to grow culturally appropriate foods (Diekmann, Gray, & Baker, 2018), having adequate transport to reach food outlets (Farber, Páez, Mercado, Roorda, & Morency, 2011), or being included in food policy processes by, for instance, getting a seat in a food policy council (Lombe & Sherraden, 2008). Within these varied approaches to inclusion, a critical yet relatively underexplored element is the framing of the concept of sustainability itself. Guthman (2008) suggests that sustainability is culturally framed based on whitened cultural histories, by assuming that it is a universal ideal and performed in one particular way. What constitutes ‘good food’ is shaped by cultural capital, ‘repertoires’ or ‘understandings, thought habits, values, ideas and routines’ in which some ethical food practices are dominant and others marginalised (Johnston, Szabo, & Rodney, 2011, p.298). Johnston et al. mention the example of a single mother on low income, who cannot afford to participate in the dominant ethical practice of shopping at a farmers market but who never overconsumes or wastes food. These food practices that deviate from the prevalent ethical ideal may in fact be environmentally friendly, even though they are often not explicitly carried out with a concern for the environment. In other words, they are performed ‘in disguise’: that is, outside the collective normative standards of sustainability (Dubuisson‐Quellier & Gojard, 2016). In applying this observation to the case of Syrian migrants, I am interested in learning what migrants themselves understand as sustainability and also which elements of their food practices may – inconspicuously – already be sustainable. What follows is a brief summary of some aspects of my recent fieldwork experiences of conducting in-depth interviews and observations with Syrian migrants in the Netherlands. My research is concerned with perceptions of sustainability (and health), and in how people make sense of it in their daily lives and food practices. I have found that, for almost all the respondents, the concept of ‘sustainability’ or ‘environmental concern’ is unfamiliar, especially in relation to food. Upon asking a dietician from the region, I learned that even though there is an Arabic word for ‘sustainability’, it is not used or understood by most people. The concept of sustainability as such is therefore not widely recognised in Syrian (food) culture and may require (cultural) translation in the Dutch food context. Seasonality and unprocessed, fresh produce are, however, not at all associated with sustainability in the respondents’ minds. Several people also mentioned buying food from the local farmer or slaughterhouse. In one Dutch city – Enschede – local Dutch farmers have even started producing Syrian cheese to accommodate the needs of their regular Syrian customers. Additionally, almost all the respondents indicated they had their own vegetable garden in the Netherlands, as in Syria, in which they grew at least grapes to make yaprak or dolma, a very popular Middle-Eastern dish. Yet they never associated these local food practices with being environmentally friendly, but rather as a means of obtaining the foods they wanted to eat. On the other hand, respondents generally did not score so well on the aspects of the Dutch dietary guidelines which recommend low meat and dairy consumption. Most Syrians did eat meat quite regularly, even though they would themselves often explicitly label it as unhealthy. In terms of dairy, cheese and yoghurt were central and frequently consumed items in the Syrian kitchen. The exception to these food habits were regular religious fasting days carried out by some Syrian orthodox migrants, which involved not eating dairy or meat – essentially, maintaining a vegan diet – for two or three days a week. My aim in highlighting these daily cultural food practices has been to show that sustainability can take diverse forms and that this diversity offers potential for multi-ethnic cities in transitioning to healthy and sustainable food systems in an inclusive manner. In order to identify shared pathways for this transition it is necessary to collaborate with the variety of ethnic groups living in cities to learn how they are experts at managing their daily food practices and how sustainability fits into their daily lives, albeit perhaps in disguise. For instance, I believe there is a pathway towards regionalisation of the food system that is at once inclusive and sustainable, which builds on the high degree of fresh vegetable consumption among local migrants and their habits of buying local, fresh food such as milk or cheese, as illustrated above. This indicates an interest in and a potential market for more local production of culturally appropriate and healthy foods in short supply chains which require little or no processing, which I see as both sustainable and inclusive. To quote Scott, Park, and Cocklin (2000), “[w]e highlight the need to examine the multitude of competing voices in a particular locality if sustainability is to be about anything other than maintaining the status quo and entrenching current patterns of inequality” (p.434). This involves looking beyond mainstream, ‘elite’ understandings of sustainable food practices and opening up the space for alternative interpretations and practices. Do have a look at the blog of the Food Climate Research network for other posts related to food sustainability. Allen, P. (2010). Realizing justice in local food systems. Cambridge Journal of Regions, Economy and Society, 3(2), 295-308. Caraher, M., & Dowler, E. (2014). Food for poorer people: Conventional and ‘alternative’ transgressions? In Food Transgressions: Making Sense of Contemporary Food Politics (pp. 227-246). Dubuisson‐Quellier, S., & Gojard, S. (2016). Why are food practices not (more) environmentally friendly in France? The role of collective standards and symbolic boundaries in food practices. Environmental Policy and Governance, 26(2), 89-100. Guthman, J. (2008). “If they only knew”: color blindness and universalism in California alternative food institutions. The professional geographer, 60(3), 387-397. Johnston, J., Szabo, M., & Rodney, A. (2011). Good food, good people: Understanding the cultural repertoire of ethical eating. Journal of Consumer Culture, 11(3), 293-318. Anke Brons is a PhD Candidate in environmental sociology at Aeres University of Applied Sciences, Almere and Wageningen University. Her research focuses on inclusive healthy and sustainable food systems in a Western urban context. She holds an MSc degree in International Development Studies from Wageningen University. You can find her on Twitter @AnkeBrons.